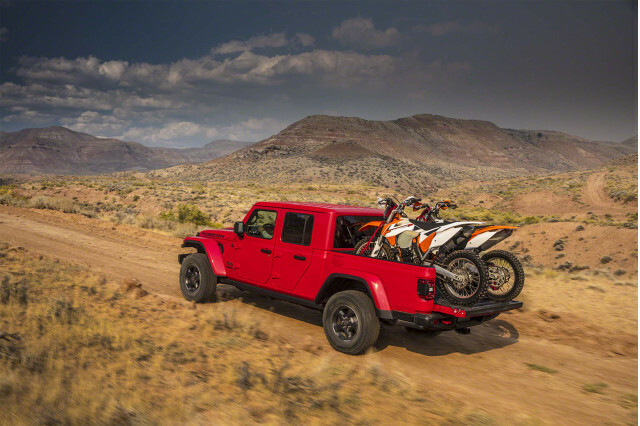 After decades away from the pickup truck market, the Jeep Gladiator returns America's off-road brand to the forefront. The Gladiator is a Jeep Wrangler four-door—up until its rear seatbacks. From there, a 5-foot steel bed handles cargo duty. The Gladiator rides on a wheelbase that's more than 18 inches longer than the Wrangler Unlimited's and its rear overhang stretches a further 12 inches to accommodate the bed. Underhood, the Gladiator shares its 3.6-liter, 285-horsepower V-6 with the rest of the Wrangler lineup. A 6-speed manual transmission is standard and an 8-speed automatic is optional. The Gladiator doesn't offer the Wrangler's available turbo-4 engine, but in 2020 Jeep says it will offer a 3.0-liter turbodiesel V=6 rated at 220 hp and 442 pound-feet of torque paired to the 8-speed automatic. With the V-6 and the 8-speed automatic, the Gladiator can be configured to tow upward of 7,600 pounds, although standard models are rated at just 4,000 pounds. Predictably, all Gladiators are four-wheel-drive. Jeep's part-time, two-speed transfer case is standard fare, although Gladiator Rubicon models add a beefier transfer case with different low-range gearing. Rubicons also throw in locking differentials, wider axles, an automatic sway bar disconnect system, and 33-inch all-terrain tires. The Gladiator Rubicon can accommodate 35-inch tires under its beefy fender flares and it'll hold a 35-inch spare tire under its bed. Inside, the Gladiator is identical to the Wrangler. Its dashboard holds a standard 5.0-inch touchscreen for infotainment and 7.0- and 8.4-inch touchscreens with Apple CarPlay and Android Auto compatibility are optional. Cloth seats are standard and leather upholstery can be added for an extra charge. The Gladiator's standard fabric soft top can be put down for a true open-air trucking experience. An optional composite hardtop includes removable roof panels that can be peeled off and all models have removable doors and a windshield that drops down after a few bolts are removed. The Gladiator can be equipped some limited active safety tech including forward-collision warnings and blind-spot monitors, but no automatic emergency braking is available. Jeep last used the Gladiator name on a full-size pickup truck based on its Wagoneer SUV. The Gladiator name lasted through the 1960s but was dropped for the 1972 model year. Prior to the new Jeep Gladiator, Jeep last offered a pickup truck in 1992 when it discontinued the boxy Cherokee-based Comanche. Jeep has teased a Wrangler-based pickup for years, including an extended-cab concept truck that bowed in late 2004.